Syrian Foreign Minister Walid Moualem warned on Monday of military retaliation in the event of future cross-border American raids, saying: "If they do it again, we will defend our territory." Why didn’t they retaliate this time? Why didn’t they retaliate after the bombing of what the US and Israel pointed at as “nuclear or chemical facility under construction” in September 2007. Why didn’t the Syrian – Iranian mutual defense agreement apply in both cases? And where do we go from here? Ever since the invasion in 2003, Iran has had the upper hand in Iraq. The “Democratic” elections brought to power an Iraqi establishment close to Teheran and somewhat “Made in Teheran”. Is it a coincidence that the so called Surge strategy is succeeding and the level of violence in Iraq has reached its lower records since American ambassador to Iraq Ryan Crocker and his Iranian counterpart Hassan Kazemi–Qomi held series of meetings in Baghdad discussing “exclusively” the security issue in Iraq? Although the invasion of Iraq probably had ideological roots in terms of “spreading the Western model of Democracy and creating a New Middle East”; on the ground this war has evolved in a more pragmatic direction. Washington is now seeking a safe exit for its troops, and on the other hand an Iraqi-American Agreement that will preserve its interests. The negotiations over that agreement were conducted by the Iraqi government, meaning an Iranian approval is implicitly given. 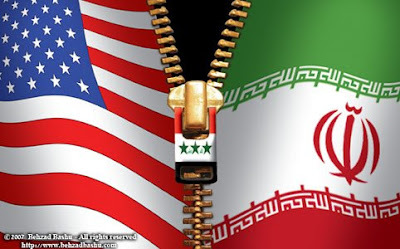 There is an Iranian American diplomatic tango going on, and it is at times getting quite intimate: In May 2008 reports revealed how Washington blocked an Israeli decision to bomb Iranian nuclear facilities. More recently the Israeli press publishes a report titled: Bush to declare renewal of ties with Iran (Haaretz, 25/10/2008). Americans are apparently acting as if nothing is possible in Iraq without the help of Teheran. And it is only a matter of time before the American implicit recognition of the Iranian role becomes a formal and declared one. The price is going to be paid in Iraq, by Iraqis. It may have the face of an American brokered “Iraqi Taef” (in reference to the Taef conference that ended the Lebanese civil war in 1989) where Washington will recognize an Iranian role in Iraq, similar to the one Syrians used to have in Lebanon. In exchange, the Iranians have established themselves as the only de facto power able to provide security guarantees to Israel: On the nuclear level, an Iranian agreement with the International community is the only nuclear security guarantee for Israel worthy of notice. On the northern Israeli front, Iran is the only actor able to ease Hezbollah’s pressure in south Lebanon and pacify the border. On the Palestinian front, Teheran has a very crucial role in guiding Syria’s policy towards radical Palestinian factions. All this comes at a time Damascus is desperately trying to reintegrate the International community after years of isolation, and when indirect Israeli Syrian peace negotiations via Turkey seem to be on a positive track. There is a serious chance the next phase opening with a new US administration in office from November will be characterized by a climate of pragmatic negotiations. The re-defining of roles and shifting alliances will all be paving the way for an honorable and safe exit of the US Army from Iraq. Finally, regarding Washington dropping its traditional allies such as Saudi Arabia and Egypt, the pragmatic Americans will find a very diplomatic way securing arms selling to the Arab Gulf Monarchies and other Arab countries, and on the other hand making them smoothly understand that Teheran is capable to give Israel in terms of security what they were never able to provide.